This book has it all: a black redneck, which is probably what you’re thinking and space zombies, which is most likely NOT what you’re thinking. Once I started, I couldn’t put it down, and knocked it out in two days! What an exciting, emotional ride! I’ll start with Jefferson, the black redneck. He, of course, is our loveable hero. I mean, who wouldn’t love a black guy raised in the Deep South who ends up being a rodeo winning child prodigy? He is by far the most interesting book character I’ve ever met. He is likeable, even with his mistakes that he realizes is too late to make right. Adopted by a white family as an infant, he cured them of their “prejudice, not KKK prejudice, but, you know, the regular sort.” Because, it seems, “prejudice is no match for love." Okay, I admit it, that chapter put a lump in my throat and made me tear up. But there were plenty of laughable and fun moments, too. Each of the characters has their own story, and they are all full of life. From the foul-mouthed and sassy six-year-old Mary, whose feet are black because she never wears shoes, to the quiet Pearl, who faints at the slightest sign of trouble. Imagine what happens when she comes face to face with space zombies. The flow of this book works well, with only one exception: the flashbacks. I don’t mind that they are there. They are even placed at the right spot so that we glean just the right amount of information to know exactly what is going on in the characters’ heads - past and present. My only issue is that they are too in your face. Instead of announcing, “START FLASHBACK” and “END FLASHBACK,” I would have appreciated them being a tad more subtle. However, that is my only issue with the book, aside from a handful of grammatical errors, which seems to be the norm in any published book. I gave this book 4.5 stars, which I rounded up to 5, simply because it was so much fun to read! And I want more. Steven Roy wrapped up the story nicely, but I see potential for a sequel. 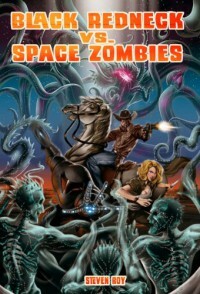 If you love aliens, zombies, or, hell, even cowboys - or a combination of any of those - you've got to read this book! You won't be disappointed.